Many of the tokens originally found in the Resource Vault, Food Crate, and Energy Box are available individually Top Shelf Gamer (US) and Board Game Extras (Europe), as well as other retailers. This is a list of games that use these resource tokens. I’d love an animal hide/fur and bananas (and maybe fish) so I can finish off my Robinson Crusoe set. JM: Sorry about my much-delayed comment. We’ll work on those tokens in a future treasure chest–we have fish ready, but we need to figure out the other two. Definitely would love to see bananas, fish, and pineapples (for Archipelago). Right on. That’s the game I’m most looking forward to fleshing out with resin bits. hehehe! Chris: Somehow I missed your comment back in January–sorry about that. Thanks for your suggestions, and we’ve taken two of them since your comment. We’ll have a fish token in a future treasure chest, and perhaps fur, though I’m not quite sure how to represent that. I think the easiest way to make a fur token would be to shape it like a deer pelt; like what you see when people have a stretched-out pelt on their wall or floor. I like the idea that someone is finally using real product (resource) pieces to use in board games. I think it would be GREAT to have MONEY/Currency included as well. I know many board game geeks that would be willing to pay for a treasure chest that could be brought out to replace the pieces of the other game pieces that are just blocks or colored tokens of a certain resource/commodity etc. Michelle: I’m sorry, I completely missed your comment back in January! Thanks for these ideas for future treasure chests. I do think (see comment below) that we’ll continue to limit treasure chests to three types of tokens per chest, but I love your ideas for those tokens! 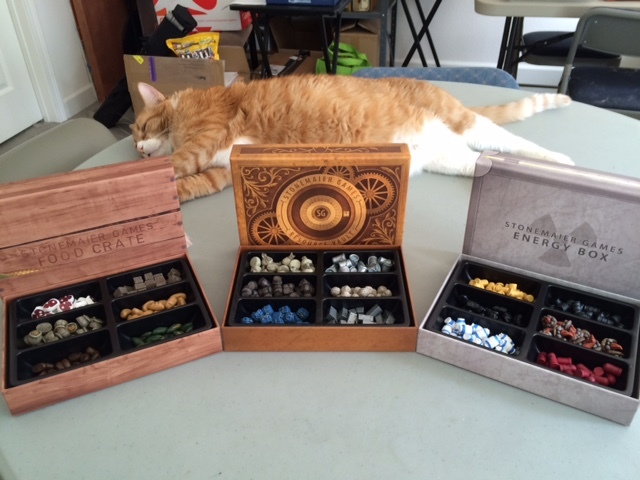 I bought the first treasure chest and let me say it is perfect and it is the best kickstarter I have participated. However, I would suggest for the these three chests you offer an additional box which allows to store the pieces of the first chest and the new ones together in only one. I would like to have each chest separately in similar boxes of course, but to have the option to join the four chests in only one too. Maybe it is a good idea for a streech goal for example. Mike: Thanks for the idea! I actually ran that concept by the backers of the first campaign a few updates ago, and I asked them to vote to see if they would be willing to pay extra for something like that, and unfortunately it was heavily voted down. I think there are a few reasons for that: One, there’s a very good chance that we’ll make more treasure chest tokens in the future, so it’s tough to make a “complete” box until the series is truly complete. Two, it cost money to make bigger boxes and a new insert, and while some backers wanted it, they didn’t want to pay for it. And three, I think one of the features of the treasure chest is that it’s small and portable. You can throw it in your bag with a bunch of other games, no problem. However, if you would add the option to acquire a big box separately in your web or in the kickstarter campaing, I would buy it. I expect the price for a separated big box will be high, and the effort to produce a few numbers of boxes (for a few amount of people) could be unadmisible, but I want you know I am one of this kind of people. Finally, sorry for my english. I am writing with a phone without languaje correction. Thanks Mike, it’s helpful to know that. The challenge is that the minimum print run for any component is 1500 units, so we would need 1500 people to do this. It’s something we might consider if we ever know that we’re producing the final Treasure Chest. At that point we might make a box to hold all of the tokens. J: Right, it depends on the box, but we would find a way to sell it by itself. I think. It would be quite hard to ship an empty box. And quite expensive for what it is, given the shipping. If I’m confident we can make it and ship it without it being damaged, I’ll consider doing it at some point. Only glaring omission I see is that there are no livestock options. Cows, pigs, sheep. All of which seem to be far more common than many of the tokens in there now. Kaleb: We considered livestock, and there’s a good chance we’ll do them in the future. They just felt a little different than typical resources. Also, MeepleSource has great wooden livestock. I would love to get the energy box for my husband’s birthday on October, he is a big Power Grid fan. Please add me to your mailing list so I know when the Kickstarter for this chest happens. thanks Claire! I’ll add you to the list. Jamey, for fur perhaps a pelt or a coonskin cap or whatever it is they call it? Also I second the motion a beer bit would be awesome for a future treasure chest. For anyone who wants something to hold all their upgraded bits I would suggest a plano box. I know the visual isn’t optional but the storage of all my bits and coins from minion games in 1 box is super convenient. Can’t wait for this to go live Jamey! @Dan: That’s a good idea about the Plano box if people want all of the tokens in one place. I like the idea of the pelt and beer bit! Heather: That’s something our sculptor took into account–he actually tested every token to make sure that it won’t roll around. Even the tokens that look like they would easily roll (the cylindrical tokens) have at least one aspect to them that prevents them from rolling continuously. A possible work around for the fur problem could be just making the cloth bundles a more earthy brownish tone so it could double for cloth and animal skin. It wouldn’t be as eye catching as the blue but I guess it’s something that could be voted on if there was enough interest. That’s a neat idea, but I think we need to keep the cloth blue to match a few games that use blue cloth (Le Havre, Rococo, etc). Most are already in the original Treasure Box, but it was missing wool and the new resources from Cities&Knights. Missing what the point would be for Catan… A big part of the game is not knowing what resources your opponents have. Anyway… i will take 1 one each!!! Amazing work and from my friend Jamey anything that he prints… i will take it!!! When will the 2nd wave of resources be available at retail? I backed the campaign for several resource kits but ended up miscounting the total number of resources that I need for certain games, so I’ll need to pick up some additional boxes. Sean: We’ll release the remaining copies to retailers in November, and I’ll have a few extra copies for direct-order. Also, Game Trayz will be selling individual tokens in case you don’t need a whole chest. Jamey, does that include Amazon? Being from Canada, it was super convenient to be able to order from amazon.ca — don’t have to deal with a sub-par exchange rate and qualifies for free shipping. Sean: We’ve moved away from working with Amazon.ca, but we still fulfill direct orders to customers in Canada from within Canada (while supplies last). We work with Snakes & Lattes now. Tina: We actually ship from Snakes & Lattes, but they don’t sell the treasure chests. Is these collections had been backed on kick-starters or not yet? If so, is it available on the market? These aren’t available on the market yet–we’re still fulfilling Kickstarter rewards. How many tokens are in the box? I just discovered this, and it looks amazing! When do you expect non-backers to be able to purchase these boxes? Christian: We only have a few left, and most of those will go to retailers. We’ll have a few spare copies for direct order–I think we’ll announce that on our November 1 e-newsletter. I’m new to your brand, but these are amazing. I’m curious…how did you come up with the number 28 for each in the box? I’m assuming it’s a cost/size ratio thing? Is the cat an addon if we get all 3 of those chests? Would the energy one meet all the needs for Power Grid? Would they fit in the frames from Broken Token? I’ve played Power Grid with my energy box, and there are more than enough tokens. I don’t have a Broken Token frame, so I’m not sure. Thanks. They are frames to keep things from sliding around. It would depend on how large these are compared to whatever is in the game by default. Thanks for your comment! I appreciate the request for silver and copper. That’s certainly something we consider someday. I’ll check out Gold West to see the shapes they use. Are you going to do something like this for the buildings in between 2 cities? I was just thinking I would love to use those buildings to upgrade power grid or other games. They are great looking buildings. These are gorgeous and I wish I had known when they were available. Oh, I have. I was introduced to you through Scythe and am very impressed. Are you going to just be making new resource tokens available, or will you be opening up all previous treasure chests as well when you make the new resources? Zac: We’re reprinting a number of older tokens to sell soon. We’ll announce it in our e-newsletter in a few months. Hi Jamey! Any news on the food energy and resource tokens coming back? Thanks! Somebody suggested Shield (Defense/Passive), Crossed Swords (Offense/Aggressive) and Scrolls (Documents) yet? I’ll put you in touch with Top Shelf Gamer to see what they can do.